Not long after Hughes death in 1976, efforts began to save and display the beautifully preserved flying boat. By 1980 it had been acquired by the California Areo Club and would be featured on the Long Beach, California waterfront. A specially designed building was constructed to house the giant. 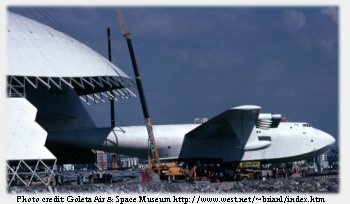 A popular tourist attraction, it seemed the Spruce Goose would be a permanent fixture at the southern California site beside the famed luxury liner, Queen Mary: Enter the Disney Corporation ......In 1988 they acquired the company holding the lease on the exhibit......Mickey was now the landlord! After two years of what they considered less than exciting financial returns from the Spruce Goose exhibit, Disney decided to lose their financial "turkey". Plans for a theme park at the location were announced.......there was no provision for the old flying boat.......the Spruce Goose had been evicted! Disney was within it's rights, but may have lacked vision giving up this treasure so easily. This announcement brought about a mad scramble to save the one of a kind example of aviation history. There was talk of dismantling it, displaying parts in different sites across the country, this would have been a tragedy. Dozens of locations across the U.S. were interested in hosting the aircraft but at this point the difficulty of moving something of this size and historic importance had to be considered. This is no small aircraft....if it were a building, it wouldn't be a small building! Now a second move was being forced on the old bird. Those involved in finding a new home for this large, and soon to be homeless artifact had their work cut out for them! The candidates for hosting the H-4 were narrowed to three locations, Oceanside, California Tourism Foundation, a firm in Tampa, Florida and Evergreen International Aviation in McMinville, Oregon. Evergreen was chosen to to make a new permanent home in it's "to be built" Air Venture Museum. A key player in the decision to get the plane moved to the Oregon site was the president of the AirVenture Museum, long time Hughes associate and aviation pioneer Jack Real......The "Goose" would be among loyal friends again, at last! Evergreen International has grown from it's beginnings in 1960 as a helicopter service operating two Hiller 12E's, to an international firm. It has the world's largest operating fleet of B-747's, operating over 100 rotary wing aircraft, involved in trucking, aircraft sales and leasing, agriculture and recently becoming an air carrier serving the far east and China. Evergreen's founder, Delford Smith, is an avid fan and collector of classic aircraft. Smith has several beautiful examples of classic types that will be displayed in the museum when completed. 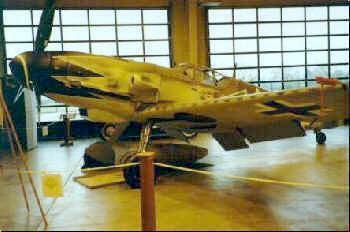 Among these is one of only three flyable Messerschmitt 109G's in the world! This is an absolutely immaculate restoration, even sporting a rare Daimler Benz powerplant, and is complete down to the 30mm cannon housed behind the spinner. This aircraft and several others currently on display in a hanger at the Evergreen facility in McMinnville, are a must see. After a look around the temporary museum, at the planes on display and the careful attention given them by the museum's many volunteers, we think the old flying boat has landed in exactly the right place.